Author Scott Craig’s new book “Second Chances” is a powerful story of a young Jewish girl’s life, destroyed by the Nazis and their unrelenting hatred of the Jews. 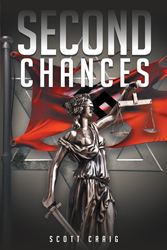 Recent release “Second Chances” from Page Publishing author Scott Craig is the incredible story of Inga Klein and how she survived the reign of the terrifying Third Reich. Scott Craig, a high school history teacher, has completed his new book “Second Chances”: a gripping and unforgettable story of love and youth lost in the time of the second World War. Published by New York City-based Page Publishing, Scott Craig’s engrossing tale centers around young and beautiful Inga Klein. Inga’s idyllic life was destroyed when Adolf Hitler took over Germany. Over the next several years, the Nazis took her family, her freedom, and sweet Fritz, her one true love. When the Allies crushed the Third Reich, they not only freed Inga from the horrors of Buchenwald but also gave her a second chance at life and love in America. But when demons from her past surface in her new life, will those second chances prove to be her opportunity for revenge? Readers who wish to experience this mesmerizing work can purchase“Second Chances” at bookstores everywhere, or online at the Apple iTunes store, Amazon, Google Play or Barnes and Noble.